We will always ensure our customers receive their shipment. If your order does not arrive within the expected delivery timeline below, please just click the chat at the bottom of our website or send us an email to warriors@warriorstacklesupply.com and we’ll be happy to locate your shipment or send a replacement shipment if necessary. All subscription boxes ship within 10 business days of the order being placed. All other products including Specialty boxes, Rods, Reels, Apparel items and other Fishing Accessories will also ship within 10 business days of the order being placed. Once your order ships, you’ll receive a confirmation email along with tracking information which is also available from the main page of your online account. You can expect delivery within 5-7 business days for all customers within the continental United States. Customers in Hawaii, Alaska, Guam, Puerto Rico or a United States Military Base are asked to wait up to 2 business weeks for shipments to arrive. Fishing Rods are not available to ship to Canada. For all other orders, you can expect delivery within 2-3 weeks after your order has shipped. Canadian tracking information is only active while a shipment is in transit within the United States. Tracking information will not update beyond the Canadian border. We ship all of our products (with the exception of Fishing Rods) with DHL and the United States Postal Service (USPS). DHL is the carrier that picks up the orders from our facility and then the individual packages are handed off to the USPS to make final delivery to your address. Fishing Rods are shipped with FedEx or UPS directly from our partner facility. We currently ship within the United States and Canada. Fishing Rods are only available in the United States and not available to ship to Canada. *Fishing Rods will include an additional $8 shipping surcharge on each order. We do not offer an option to upgrade your shipping at this time. Once your order ships, we will send you a confirmation email with tracking information. You can also login to your account at anytime to check the status of your shipment and view tracking from the main page after logging into your account. Tracking numbers may take a full 24-48 hours from the ship date to activate, and it’s normal for a few days to go by without a location update. Please be aware that if your order contains more than one item you may receive more than one tracking as products may ship from different locations depending on the item ordered. All shipments come equipped with forwarding capabilities which means customers can edit their shipping address while a shipment is in transit by contacting a USPS Post Office and requesting ‘Mail Forwarding’ to get your package re-routed. Please be aware it can take up to an additional 2 weeks to arrive once a shipment has been re-routed. We DO NOT accept returns or exchanges for our monthly subscription boxes, specialty boxes or fishing rods. These products are nonrefundable and are ineligible for returns or exchanges. This is a firm policy. For all other orders, we offer a 30-day limited return policy applicable to all Reels, Apparel or additional Fishing Accessories that we sell on our website. You may return a qualifying product (Reels, Apparel and additional Fishing Accessories) for a full refund of the purchase price within 30 days of the original order date. Products must be in new, unused condition and returned in original, undamaged packaging. You’re welcome to open your package and inspect the product, but we can not accept a return if the product shows signs of use. Proof of purchase is necessary. Return Shipping Fee: We are happy to accept qualifying returns and/or exchanges, although the return shipping fee will be deducted from the total refund. Account Credit Usage: If following your purchase, you spent the associated account credit before arranging a return, your total refund will reflect the purchase price of the product minus the dollar value of the credit spent. If your account credit is used while your return is in transit back to our facility, your total refund will reflect the purchase price of the product minus the dollar value of the credit spent. Unused account credit tied to the purchase will be removed from your account when your refund issued. After 30 Days: We will not accept returns, for any reason, after 30 days of the purchase date. Product delivery date will not be considered in the 30 day return period. Used Products: We do not accept returns for products that have been used or are not returned in original packaging. If a product arrives at our facility showing signs of use or in packaging other than the original retail packaging, we maintain the right to deny your refund and return the product back to you. Warranty Requests: Please contact the manufacturer with warranty or repair issues directly. Many of the products offered by Warriors Tackle Supply are covered by great manufacturer warranty and repair programs. This may be a good option if you’ve already used your product and have since discovered a manufacturer defect. 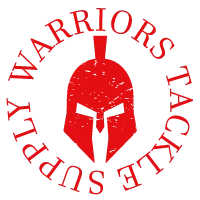 If you have any trouble contacting the manufacturer directly, please just click the chat at the bottom of our website or send our support team an email to warriors@warriorstacklesupply.com with your full name, email address and order number (if available) and we’ll be happy to help.